Brazen Berry is part of the new Maybelline Color Sensational Vivids collection which promises brighter, more vivid color and a creamy moisturizing texture. This formula contains honey nectar which is supposed to help keep lips nourished. This shade is permanent although there are some limited edition shades available in this formula. This color looks intimidating in the tube but it’s actually very wearable when paired with complementing blushes and eyeshadows. 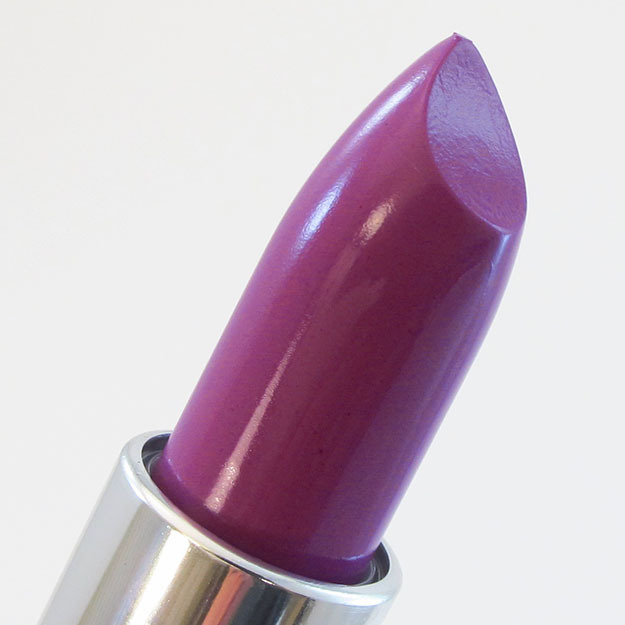 Color/Finish: Brazen Berry is semi-opaque brightened grape with a semi-glossy finish. It lies somewhere between red-violet and true purple. Packaging: The packaging is the same as the regular Maybelline Color Sensational Lipsticks except that the lids are all the same neon orange-red color. Very eye-catching when you are browsing the beauty aisles! The lid stays on securely and the tube twists up smoothly. Smell/Taste: The Maybelline Color Sensational Lipsticks have a distinct smell to them that is fairly strong. If you own any of them, you know what I mean. I wouldn’t describe it as a fragrance. It’s more like toffee except it is not sweet. Keep this in mind if you are sensitive to smells. This did not taste like anything to me. Application: This shade has been a bit tricky. Sometimes it applies smoothly and evenly and at other times it applies a little bit patchy and seems to clump up (as you can see demonstrated on my arm swatch below). It applies more sheerly than the three previous shades I reviewed but with two or three layers you can get almost the same opacity as Fuchsia Flash or Hot Plum. It felt moisturizing, creamy, and didn’t slip or move around on the lips. It did get slightly drier as the day wore on but it did not make my lips feel dry. It didn’t settle into lip lines. Pigmentation: Good pigmentation, semi-opaque. It did leave a slight stain on my lips for a couple of hours but it was nowhere near as obvious as the stain Fuchsia Flash and Hot Plum left on my lips. Texture: Hot Plum is semi-glossy and remains that way for a couple of hours. Although a little inconsistent in texture, it was thick and creamy and adhered well to the lips. Longevity: It lasted about 5 hours on me. At that point it faded but it faded fairly evenly. It did not get patchy or dry out my lips over time. Worth buying? Yes. I can overlook the texture issue because the color is unique at this price point and it really doesn’t take much work to make it sit evenly on the lips.